Mal Eastick, one of Australia’s finest blues rock guitarists, has a passionate, explosive and soulful style that has been featured with some of Australia’s biggest recording and performing acts for over 30 years. 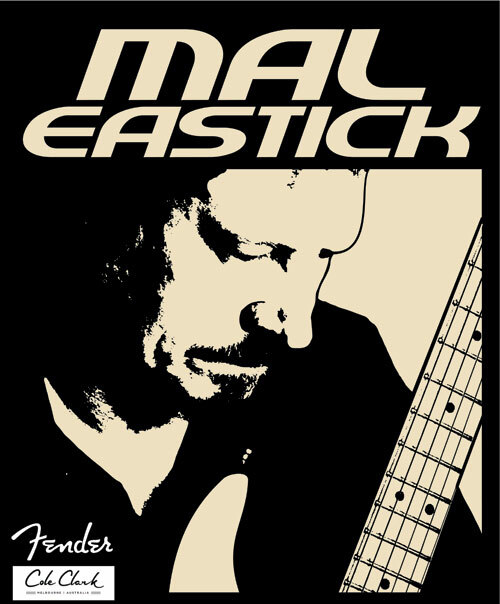 Mal Eastick is widely considered to be one of Australia’s finest musical protagonists of blues/rock guitar. Playing guitar since his mid-teens, Mal has achieved a standard of playing that is, at once, both envied and admired. Mal’s early career was epitomized by his time with legendary band, Stars, and his work on the Andy Durant Memorial concert and album. Stars achieved significant national success during the mid to late 1970’s and toured in support of such acts as Joe Cocker, Linda Ronstadt and The Beach Boys. One of the bands many career highlights being playing “The Concert of The Decade” on the steps of the Sydney Opera House to an estimated 120,000 in 1979. In the 1980s Mal played in the Jimmy Barnes Band, played guitar on Jimmy’s first two solo albums – “Bodyswerve” and “For The Working Class Man” – and also formed his own touring outfit. Two albums, Southern Line and Spirit have followed. Both critically acclaimed, they are available through Mal’s own label, Bluefish Records. In 1993, after experiencing two seizures, Mal was diagnosed with an abnormal tangle of arteries and veins (known as an arteriovenous malformation “AVM”) in the left temporal lobe of his brain, but it was not until 2001 that surgery became possible. After several major neurosurgeries, as well as six carpal tunnel surgeries, major rehabilitation and almost 4 years away from the stage, Mal returned to playing live. He returned to the stage at the 2004 Longview Concert as a special guest of old friend and inspiration, Kevin Borich. Mal’s performance at that event was both emotional and powerful. He jammed that night with Kevin and Longview headliner, The Eagle’s Joe Walsh. It was a very emotional evening for Mal as the many years away from the stage had sapped Mal’s confidence to the point where he questioned whether he would ever play again. In 2014 Mal and his band competed in and made the semi –finals of The International Blues Challenge in Memphis, USA. A highlight of the trip saw them record at the legendary Sun Studios in the footsteps of Elvis and Johnny Cash. Originally from South Australia, Mal and his fellow Stars band mates Mick Pealing and Andy Durant were inducted into the South Australian Musical Hall of Fame in 2015 for their contribution to South Australian music. Mick & Mal performed a selection of Stars songs on the night. Well, here we are now in 2019 and Mal is certainly still playing. He is as proud as he is humbled by his recent induction into the SA Music Hall of Fame and the gravity of such an acknowledgement by his peers urges him on. The one constant through it all is a man and his guitar. It sounds so simple yet it’s so complex. The guitar is to Mal what a tail is to a kangaroo. It’s integral to its being. It provides it its balance, assists its momentum and serves as a support when life pushes it backwards. To say that Mal has had his fair share of “the blues” would be an understatement. How he continues to pick himself up and maintain the drive and dedication required to be a full time musician after so many decades can only be answered by Mal himself. Sit him down and get him talking and it’s a lesson in Australian Rock n Roll history delivered by one of the main characters of the era.